Two regional dailies which switched to publishing weekly in October have seen their circulations increase. The Gloucestershire Echo topped the latest ABC figures for paid-for titles, while fellow Trinity Mirror newspaper The Citizen, Gloucester, came in third. The pair made the switch from daily to weekly in October, and the Echo has posted an 18pc year-on-year increase in circulation for the period ending December 2017. ABC issued both titles with separate certificates during 2018, showing their average circulations as dailies from January to September, and as weeklies from October to December. The Echo’s average circulation as a daily from January to September stood at 6,978, while The Citizen’s certificate for the same period showed it had an average circulation of 7,541. 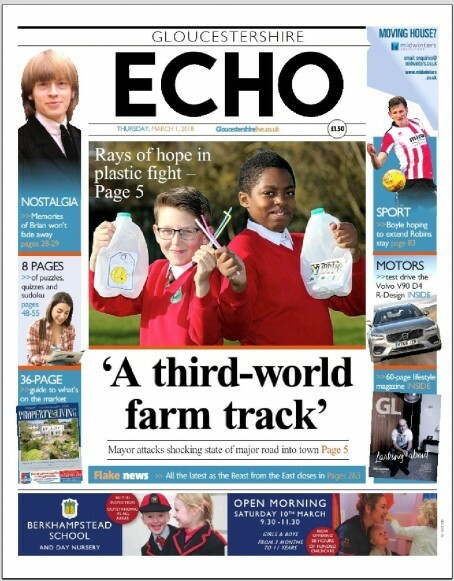 As a weekly, from October to December, the Echo’s stands at 9,543, while The Citizen’s stands at 9,611. Of the paid-for titles which had published as weeklies all year, the KM Group’s Folkestone & Hythe Express topped the charts with a 10pc year-on-year increase from December 2016 to December 2017, giving it a total circulation of 1,717. Scotland on Sunday, whose circulation now stands at 16,289, was the only other paid-for non-daily to experience an increase. Of the free weeklies, Archant sister titles the Ilford Recorder and Wanstead & Woodford Recorder topped the charts with 69pc and 34pc increases in circulation respectively. The Ilford edition of the paper is counted as a free title, but has a paid-for circulation of 2,303 out of an overall circulation of 6,192. Another of the company’s weeklies, the Sudbury Mercury, came third in the table with a 22pc rise. Free titles to experience a single digit circulation increase were the Ealing Gazette, Runcorn and Widnes World, Dearne Valley Weekender, Nuneation News, Bury St Edmunds Mercury and Rotherham Record. Full figures for paid-for weeklies, in order of circulation increase, are as follows. Scroll down for the list of free weeklies. With average decreases of 12-15%, on top of previous years’ bad numbers, you wonder how much longer is sadly left for many of these titles. The Birmingham Post is particularly dire, selling just over 3000 with bulk sales and freebies included. Not that long ago (ten years maybe), it sold over 20000 as a daily. A great shame. Yet more staggering losses for Archants Norfolk weekly paper portfolio raises the question of just how far are these allowed to slip before their copy sales are deemed to be unacceptable and unprofitable and action is finally taken to pull the plug or go free? With sales as bad as these reported today they must surely be running at a loss and can longer be viable. Let’s look at a bit of background. Dailies turned weeklies enjoy a significant spike in sales which is not maintained and then the weekly sells significantly less than it did as a daily. Turning weeklies into dailies has proved a failed business initiative. The proof: JP switched dailies selling 14,000 to 18,000 copies into weeklies because they were not sustainable and they now sell far less than they did six days a week. Other dailies have continued their sales decline and haven’t been switched eg Hartlepool Mail on 4,000 plus. So embarrassed is JP at the sales figures papers such as the Halifax Courier are omitted from the league tables of doom. As all three paid fors sell such a pitiful few, the best option would be to make this bumper weekly a free paper thus giving the ad reps more of a chance of selling into it , it’s either that or closure as far as I can see as if this level of consistent decline continues the papers would completely disappear within the next couple of years. It’s hard to disagree with the points you make @WestYorksAnalyst but my greater concern is the apparent lack of a Plan B by the publisher, their usual next step when ABCs are released is to pass the loss on to the customer in the form of yet another unwarranted price rise which only fails to drive ve more current buyers away that it gains in additional revenue. With ailing and failing papers continuing to lose readers and revenue week after week the only options are:ignore things and carry on as now and let the market take its obvious course resulting in likely closure,go free, go online only, merge titles or close them completely, I can’t see any other options. The time for indecision and inaction has passed as at current rates we will be seeing long standing titles close continuously all through the coming year. Am I missing something? I don’t see how an average daily circulation of 6,978, equal to 41,868 copies over a six-day week, compared with a now weekly circulation of 9,543 is an increase! The historic evidence of previous daily to weekly conversions suggest that the new weekly figures will drop to the same as the previous daily ones within 18 to 24 months. Cover price increases offset some of the loss in income but the rest will come from cuts in editorial staff and savings on distribution – both of which damage these ailing titles even further. I’m all for the digital-first strategy but decimating print titles this quickly only provides shareholders with a short-term gain and is partially why the transition to digital is proving so difficult. It pretty much puts these titles on an instant level playing field with any hyperlocal start-up. Well done the Arran Banner. Small is indeed beautiful. The old, traditional ways of putting a newspaper together still hold good. It also helps that the team have experienced hands on board. Cheers Eyebrox. We have a small but dedicated team who know their patch inside out. They deserve enormous credit. We also like to think we make the most of traditional print as well as digital. Around 13% of the Banner’s circulation now comes from digital subscribers. Crucially they are happy to pay for unique local content. We value our content (and our journalists) and don’t give it away for free.